Motorcycle riders and their passengers are exposed to the possibility of great bodily harm when an accident occurs. For obvious reasons, motorcyclists face greater bodily harm more so than people traveling in an automobile. In an automobile, driver and passengers are well-protected by a steel cage, seatbelts, and air bags. Motorcyclists, even when geared to the max, are more vulnerable out on the roads. New Hampshire motorcycle accidents are frequently caused by automobile drivers who simply do not see the motorcycles. According to national studies, automobile drivers sometimes cut motorcycle riders off, turn into their path, or violate their right of way. Even in a slow-moving accident, cyclists can suffer major injury. Moreover, simply because motorcycles are smaller than automobiles, it is much easier for motorcycles to get lost in an automobile’s blind spot or be missed at an intersection. Their smaller size also makes it more difficult for an automobile driver to gauge how far away motorcycles are, or how fast they are traveling, leading automobile drivers to misjudge the distance of motorcycles as the auto drivers are entering or exiting an intersection. While effective headlighting and taillighting and bright gear may help increase your visibility to auto drivers, the reality is that motorcyclists who make the best efforts to enhance their visibility are still sometimes not seen by an automobile driver and suffer injuries from an accident. Motorcycle accidents in New Hampshire are often times caused by an automobile striking a motorcyclist from behind, either because the motorcycle stopped faster than the automobile, or because the motorcycle slowed not by using the brakes, but by downshifting or rolling off the throttle, so that no brake light illuminated. Automobile drivers commonly misjudge the speed of a motorcycle. Unlike automobile passengers, motorcyclists are also in greater danger from physical hazards on the road. Wind, road debris, gravel, bridge joints, uneven road surfaces, wet roads and other roadway hazards are simply a greater risk to motorcyclists and their riders than those of automobiles and trucks. Lower extremity injuries are the most common in motorcycle accidents, but head injuries are most severe. Helmeted motorcyclists have fewer head injuries, but even fully geared riders who are involved in an accident can suffer significant injury. 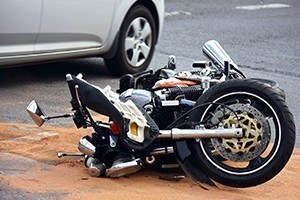 If you have been injured in a motorcycle accident an attorney can help you evaluate the situation and help you obtain the most favorable outcome possible. You will need to take care of your injuries and medical bills and you want experienced Manchester NH motorcycle accident lawyers. Contact The Motorcycle Accident Lawyers at 1-888-511-1010. Our personal injury attorneys are longtime motorcycle riders who know the technical aspects of motorcycle accidents and will provide you with a free telephone consultation to determine the best course of action. Motorcycle Accident Lawyers is a trade name of Tenn And Tenn, P.A. Our New Hampshire motorcycle injury lawyers are experienced motorcyclists who are dedicated to serving the needs of the motorcycle community. We have a proven record in negligence law and personal injury law and want to help you through the difficult, and often confusing, times after a motorcycle accident or motorcycle crash.